I was a big supporter of Obama over Clinton all through the 2008 elections, and was skeptical of her cabinet appointment, but you know what-- I think she is going to do a good job at State. And I know that her arrival is going to be a huge relief to the staff and diplomatic corp all over the world. I know many folks who work for the embassy here in Japan and others around the world. This group, more than most, has been truly held hostage for 8 years. Most are career foreign services members-- and believe profoundly and deeply in diplomacy, cultural understanding, global cooperation and good will. Imagine that is your core belief and you have to work under the Bush administration for 8 years. Many former state folks left, and others held on-- feeling that if they abandoned their posts things would get worse. That at least by hanging in there they could try to mitigate some of the anger and justified disgust at the USA's foreign policy under Bush and Co. 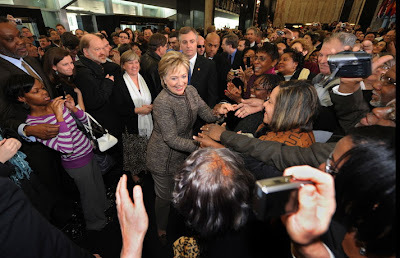 The film footage of Hill's arrival at the State Department says it all. There was cheering and yelling and ear to ear grins. And this from a normally pretty sedate and understated crew of folks. If Bill stays out of the way, and If Hillary allows herself to be guided by her better angels-- this could turn out to be a fantastic decision. Time will tell.